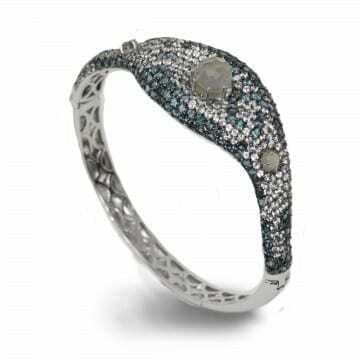 The sterling silver bangle is set with oval cabochon cut London and sky blue topaz. The topaz have a carat weight of 15.42ctw. 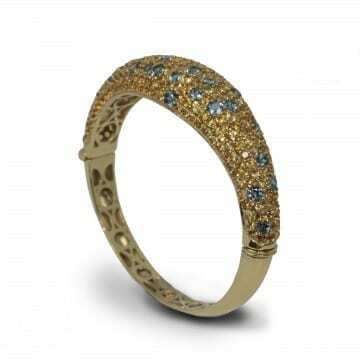 The yellow sterling bangle is pave set with citrine and blue topaz. 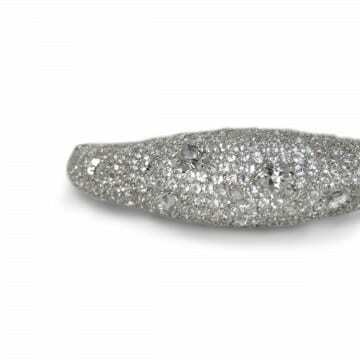 The bracelet has a carat weight of 14.85ctw. 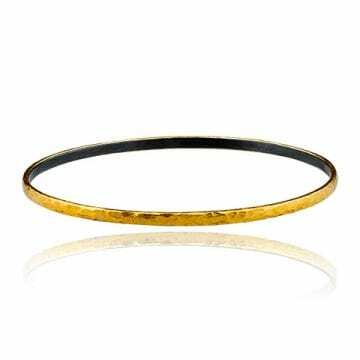 The 24kt gold & oxidized sterling silver bangle is 4mm in width. The 18k rose gold bracelet features (1) morganite (1.55ct) accented by (16) round brilliant cut diamonds (0.25ctw.) From the Dove's Jewelry Rose Collection. The 18kt yellow gold bracelet features (1) mother of pearl & clear quartz doublet (2.54ctw) accented by (28) round brilliant cut diamonds. From the Dove's Jewelry White Orchid Collection. 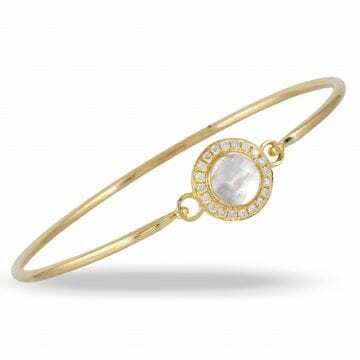 The 18k yellow gold bracelet features (1) mother of pearl & clear quartz doublet (1.31ctw) accented by (20) round brilliant cut diamonds (0.24ctw.) From the Dove's Jewelry White Orchid Collection. 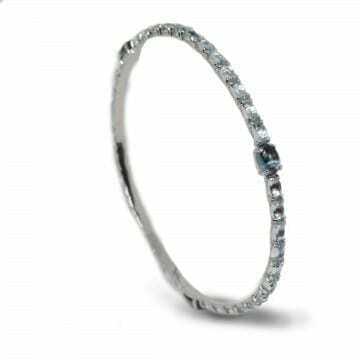 The sterling silver bracelet features grey chalcedony surrounded by round brilliant cut London blue and white topaz. The bracelet has a carat weight of 13.0ctw.